Jewel Safaris is based in Kampala, Uganda, midway between Kigali (Rwanda) and Nairobi (Kenya). Whether you are “On Safari” in the wildlife-stuffed savanna’s of the Serengeti and Ngorogoro Crater, experiencing firsthand the Wildebeest Migration in the Masai Mara or gorilla Trekking on the mist-covered hillsides of the Uganda/Rwanda border spending hours among a family of Mountain Gorillas, the staff of Jewel Safaris are the experts that will entertain, educate, inspire and amuse you. Jewel Safaris has become synonymous with Ugandan Safaris; we will provide you with an experience of a lifetime, whether you select one of our popular ready-made Safari packages, or a tailor-made adventure. Our seamless service has not only resulted in high marks by former clients, but has gained us great respect within the Tourist Industry. Jewel Safaris together with our professional network of travel experts will bring the magic of the African Bush for you to enjoy. We provide Safaris and adventure tours within Uganda, Kenya, Tanzania and Rwanda. Jewel Safaris is a full service Travel Agency and are well equipped to also book flights, accommodation, restaurants, park permits and car rentals. Our clients have been telling us that we are very different from others in this field. They tell us that they always feel very important to us; that we treat them not like clients but like family. Specifically, we are told over and over again, that there is no-one in the Travel Industry that they have come across that gives so much individual attention and concern as Jewel Safaris. We work hard at this, and are so happy when our clients appreciate all the effort that we put into making each and every one of them our first priority. Our staff have been with us for a long time, and we are proud of them all – kind, considerate, generous, caring people that really focus on what our clients want. We all spend a lot of time asking a lot of questions to put together a true profile of every client’s dream safari and putting it down on paper to create a personalized magical adventure. Our people love the African Bush and coupled with their desire to share these passions with others, makes our Safaris different from the rest. The staff of Jewel Safaris have a deep love for the African Bush and a desire to share their passions with others. As a result, each and every Safari is significantly different from those offered by others. We are on a first name basis with hotel and campsite operators, we work closely with the Rangers in the National Parks and we go that extra mile for our guests by choosing optimal viewing sites on game drives, as well as unique cultural encounters with traditional tribal members and well-known local community groups in remote destinations. Our website has been designed to give you both an overview of the most popular ready-made Safaris that our clients enjoy as well as inspiration to create your own Safari adventure, focusing on what matters most to you. In Uganda, we offer not only Safaris to the 10 magnificent National Parks, but other destinations not so well known, such as the Ziwa Rhino Sanctuary, the Ngamba Chimpanzee Island Sanctuary, Lake Bunyonyi, the Ssese Islands, to mention just a few. Uganda has 12 Wildlife Reserves, 5 Community Wildlife Management Areas and 13 Wildlife Sanctuaries, in addition to the 10 National Parks. Jewel Safaris has also introduced something completely new and exciting for the African Safari Adventurer. Over the years, we have been told by our clients that they are very interested in some cultural content in their Safari agenda. This has become more and more significant, as travelers want a more diversified itinerary. In response, we have introduced two new destination categories, to enhance everyone’s experience; something no one else in the industry is able to do. The first is the Historical/Cultural focus. This enables our clients the opportunity to mix and match their agendas to include as much cultural and historical content as they wish. We are well aware of the incredibly diverse nature of Uganda’s culture and its fascinating tribal history. Sharing our insights with our clients and arranging cultural visits to remote and isolated tribal people in their homelands, has put us way ahead of our competition in terms of creating unique and interesting Safaris. The second new focus that we have introduced recently is that of culinary experiences. We understand that food is a very important aspect of a traveler’s experience. We know that in Uganda, our local cuisine is very unique and we also know that sharing this information and allowing our clients to be introduced to these Ugandan foods will greatly improve their overall satisfaction with both our company, as well as with the entire Ugandan Safari experience. We have many people in small villages and remote communities that understand how our clients enjoy these cultural and culinary encounters. For many, it is in fact, their main focus when coming here to Africa. Many of these local people, have opened not only their hearts but their doors to our clients. We can offer intense encounters with peoples of different tribal backgrounds; preparing and eating local foods, overnights in local villages and educational experiences never before offered to outsiders. Jewel Safaris is now equipped equally as well to do wildlife safaris as well as cultural/historical/culinary Safaris. The popularity of these mixed agendas is enormous and being the leader in introducing these unique adventures to our clients, Jewel Safaris has once again set us apart from the dozens of less innovative Safari companies in Uganda. We are the experts, particularly in Uganda, our homeland. In addition, day trips within Kampala city, or to Jinja, the source of the Nile, for example, can fill in those gaps created by the midnight flights out of Entebbe. We are full of suggestions and hope we can have the opportunity to sit down with you to help you make your travel to East Africa the best wildlife and cultural experience ever. Come with us; when you come with us you are not a tourist, you are a guest. One of the biggest differences between Jewel Safaris and the others Safari operators is our attention to Safety and Security. We make our client’s safety and security our top priority. Whether you are camping on Safari, Trekking the Gorillas or Chimpanzees, or visiting one of the urban centres such as Kampala or Nairobi, we anticipate your safety needs and carefully plan for contingencies. You always travel with trained staff, with the highest standards for safety and security. Before starting off on your African Adventure with us, we will fully discuss with you, your safety needs and any concerns you may have with traveling in East Africa. At Jewel Safaris, we know that you are going to spend a lot of hard-earned money to have this African adventure, that in many cases, you have been dreaming about for a long time. Our goal is to make your Adventure Safari the absolute best possible. We pride ourselves in investing a lot of time and energy into the planning process of each and every Safari that we put together. We have many questions to ask and in this way we can create a unique profile of your time and financial constraints, your likes and dislikes, your interests, your concerns and your dreams. Our team then takes this profile and we collectively mix and match what is available and come up with a unique Safari, designed just for you. In that way, we are also unique. We don’t know anyone else that takes as much time and energy as we do on this process. We believe that this process is creating the foundation of your adventure; without a sound foundation one cannot have a sound Safari. Another unique aspect of our company, Jewel Safaris, is our concerns with wildlife conservation and community responsibility. We believe very strongly that we have a responsibility to actively invest in both the conservation of East Africa’s wildlife as well as the indigenous people that live in the destinations that we bring our guests to visit. 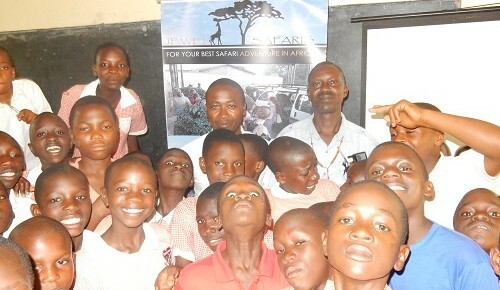 Jewel Safaris is actively supporting the Jumbo Primary School in Mbarara, Southwest Uganda. Over the years, the Jewel Safari team members have completed a new kitchen, solar system and water harvesting tanks for the school.